Their tiny bunny brains are being saturated in my veg-free mind waves. 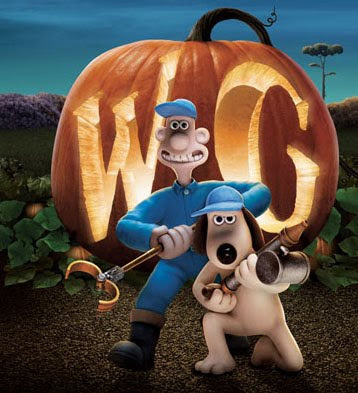 After neighbors complain about rabbits invading and destroying their prized vegetable gardens, Wallace and Gromit use their animal-relocation service, Anti-Pesto, to humanely capture the adorable intruders. But when an experiment to displace the rabbits goes awry, Wallace and Gromit discover that they have a much bigger, much furrier problem on their hands. Ralph Fiennes is the voice of Lord Victor Quartermaine and Helena Bonham Carter plays Lady Tottington, the object of both Lord Victor's and Wallace's affections. Two more reasons why you should add this to your Netflix queue. Gumby, I love you and Pokey (Goo, I could go without) but this movie wins. On that note, let's make some Carrot Cake Cupcakes. * Whatever you do, don't use baby carrots on a hand grater. You will be grating carrots until Christmas. True story. Preheat your oven to 350 degrees. Line a muffin pan with 12 cupcake liners. In a medium bowl, sift together flour, cinnamon, allspice, baking soda, baking powder and salt. The original recipe didn't call for allspice but I wanted to add a little extra zip-a-dee-doo-da to the cake. Go ahead and throw some nutmeg in there, too, if you're feeling spicy. In a separate bowl, beat the eggs and sugar until frothy. Look at all that Vitamin A. I can almost feel my eyesight correcting itself. Fold in the flour mixture just until combined. Try not to over mix the batter. You want the wet and dry ingredients to do a delicate waltz. Not a full on bump-and-grind train. Evenly distribute the batter between the muffin cups. Carrot cake batter tends to be pretty thin. A measuring cup works wonders for this step, as I discovered 3/4ths of the way through. Bake the cupcakes for 15-20 minutes or until the toothpick tester comes out clean. Let them cool on a wire rack while you make, what is quite possibly, the easiest frosting your hand mixer will ever set its beaters on. Beat together the cream cheese, butter, vanilla and confectioner's sugar until it starts to resemble frosting. The end. Frost the cooled cupcakes. And if you happen to have too much time (and extra fondant) on your hands, make a little carrot to adorn your baked mounds of happiness. I don't crave carrot cake often and it's usually the last option I consider when I'm looking at a dessert menu. But as soon as I have a bite, I always scold myself for ever neglecting it. Because it's pretty damn tasty. For a brief moment, I almost took my glasses off because my vision was getting better. DUDE! I LOVE Wallace and Gromit. My favorite movie is The Wrong Trousers. LOVE, LOVE, LOVE it! "Ah, but I do like a bit of gorgonzola!" I was totally going to post a link to The Wrong Trousers but I didn't want anyone to be like, "Dude, this is a food blog. Chill with the film recommendations..."
I agree with Margie, The Wrong Trousers is incredible. I have a Wanted Poster coffee mug with the penguin with the rubber glove on its head: "Have You Seen This Chicken?" These look really delicious. I LOVE the little carrots. MUCH more detailed than mine ever are. @Girl Foodie-I must get a mug like that. The wanted poster was awesome. The train sequence mesmorizes me. do you make your own fondant or do you purchase it ready made? All of the W&G love is making me want to watch it this weekend. Chicken Run, too. I don't want to be a pie! I don't like gravy. I feel like we have bff potential. Not just because of Wallace and Gromit, the Craft, carrot cake, but because you remember guts.